It was almost midnight when the loud ping of my cell phone announced a message had arrived on WhatsApp. Must be from Italy, I thought, since all my friends here in California were probably asleep. I clicked open the phone, unprepared for the emotional surprise it held. “Gallena vi aspetta!” read the exclamation beneath a photo, “Gallena awaits you!” Those three little words and the image on that tiny screen seemed larger than life and triggered an unexpected wave of nostalgia to wash over me as hot tears flooded my eyes. 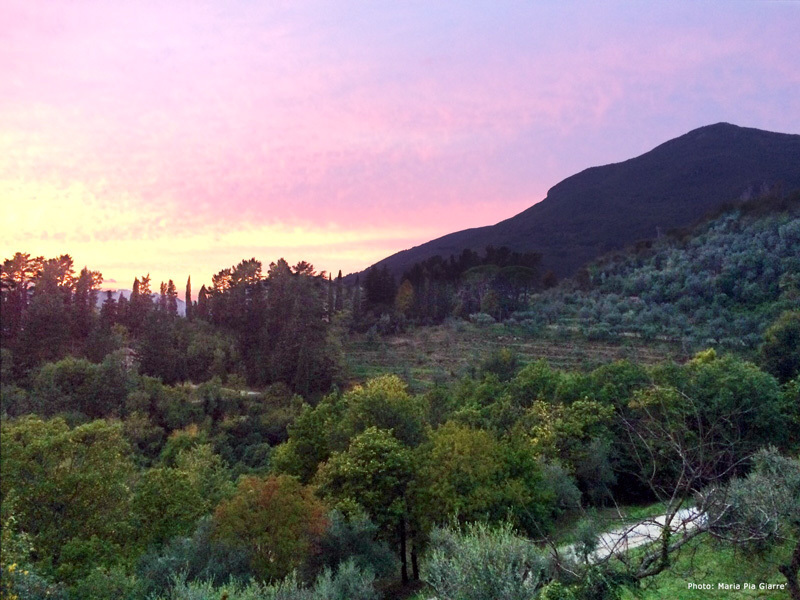 There it was — Gallena — my Tuscan home-away-from-home and the place I longed to return to for so many years. It was waiting for me! I studied the house in the photo like it was the face of a dear old friend — feature by familiar feature. It was just as beautiful as I remembered. The petite yet sturdy country house built a century ago of unique blush-colored stones seemed to glow in the sunlight. Its rosy hue was accentuated by forest green shutters adorning the facade and an opulent spray of flowering jasmine that framed the entrance in a regal archway. Like the well-calculated perspective of a Renaissance painting, the photo drew me in. When I noticed the open door that beckoned me inside with a warm, welcoming gesture, my heart did a little flip. I felt back home already. Italy had been my home for decades and the literal backdrop to my life story — and Gallena was a big part of that story. Gallena is a large rural estate owned by Maria Pia’s husband Gianni’s family located in the lush, green hills of Camaiore — a tiny town in Tuscany near Lucca perched high above the pristine beaches of the Versilia coast. The homes that dot the private hillside property belong to Gianni’s siblings and cousins. It’s where they gather on weekends to escape hectic city lives and a sacred place for quality time with family and invited friends. I am one of those lucky friends though they treat me like famiglia. Over the decades, my husband, children and I spent many idyllic summers, holidays and weekends there and, while I know many of the other houses inside and out, the home I know best is Maria Pia and Gianni’s. So many magical memories were made there and now I would return after endless days, months and years of waiting…wanting. Once my daughter and I finally arrived in Italy, the car ride down to Tuscany from Milan was so full of chatter and catching up with our Italian friends that I barely noticed we’d arrived at Gallena until we were at the gate. The Range Rover barreled up the hill in twists and turns along the narrow country road, cutting through thick woods that blanketed the property. My heart raced in anticipation as we zig-zagged up the steep hill, each familiar curve bringing me closer to the house. “Would it still be the same?”, I asked myself then prayed “I hope so.” The tires growled on the gravel road as Maria Pia floored the accelerator to round the last hairpin turn before the house came into view in the distance. At last! I didn’t need to walk through the door to know what was inside. I knew every detail by heart, especially the kitchen. Even blindfolded, I could walk in and cook a decent meal. 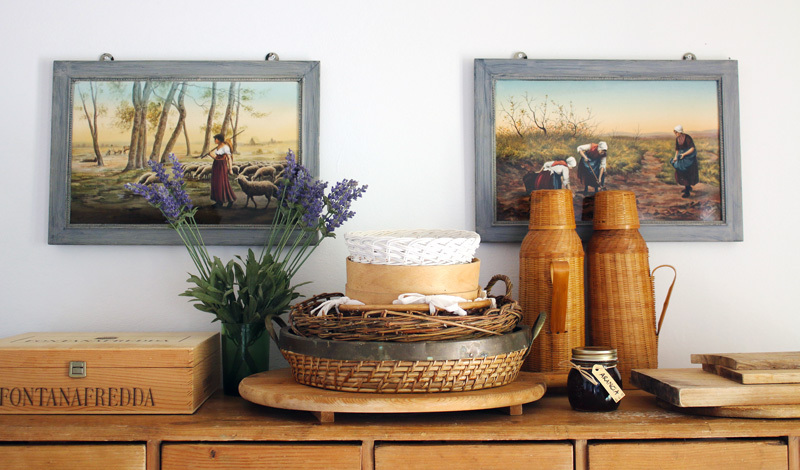 A simple country cucina, it was the perfect mix of rustic, artsy and functional with everything needed to cook for a large crowd — and we were always a large crowd. Once inside I saw that everything was as I remembered. 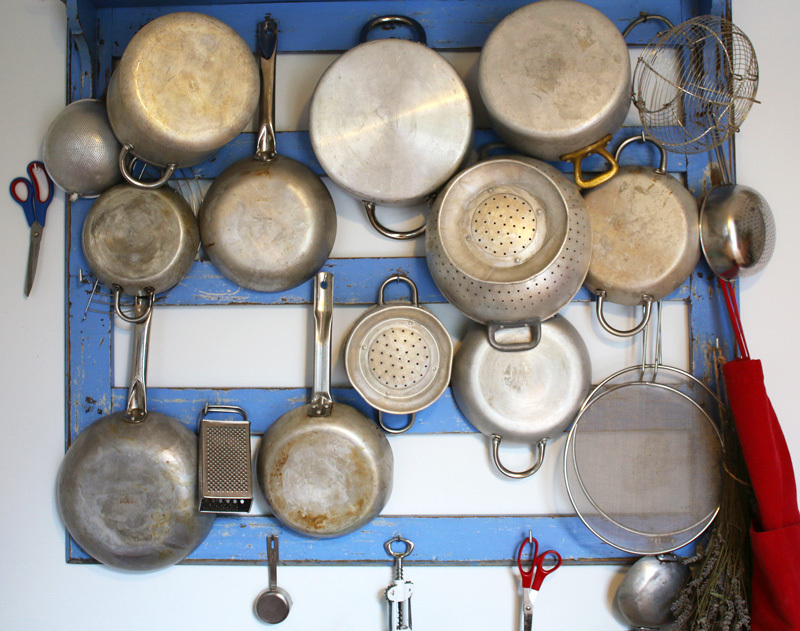 The familiar brushed aluminum collage of pots and pans hung, without rhyme or reason, like an abstract painting from a periwinkle blue frame nailed to the stucco wall. The white marble countertop from neighboring Carrara that was lovingly etched from decades of daily use. And the piece de resistance — a vintage wooden laundry ironing station — stood proudly in the middle of the room serving as the central workstation and center-of-life around which everything in the house seemed to happen. The antique kitchen objects that embellished the walls gave the cucina its quirky, age-old character but were useful as well. 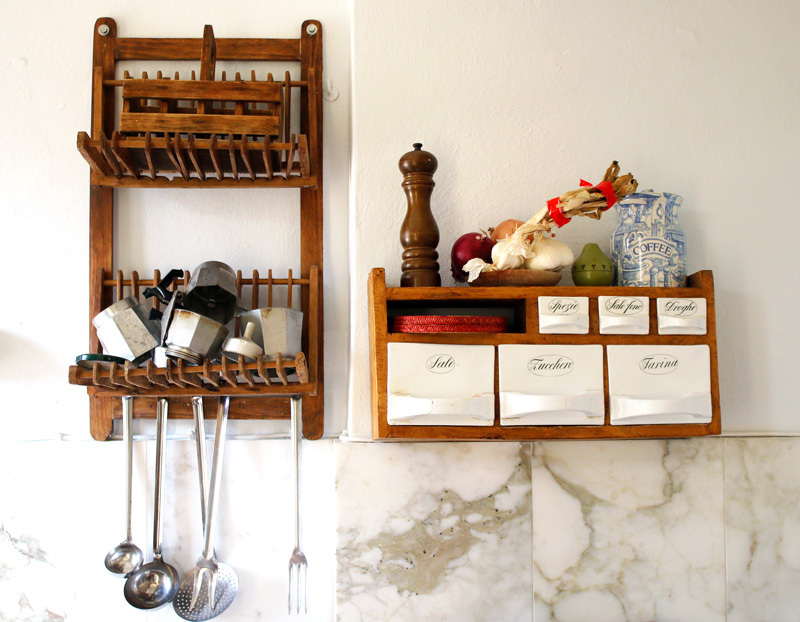 Salt was pinched from porcelain spice drawers near the stove and Italian Moka coffeemakers stood ready to use on the hand-carved wooden drying rack. Although the kitchen wasn’t fancy and didn’t have the professional chef tools I use in the U.S., it was heaven to me — and just the inspiration I needed to make authentic Tuscan food again. I couldn’t wait to start cooking! The opportunity came when my friends went to Milan for work and I stayed behind with our now-teenage children and played mamma to a group of delightful bravi ragazzi for the week. When everyone was headed back for the weekend, I wanted to prepare dinner to welcome them home. At the time, Italy was experiencing a record heat wave with temperatures in the high 90’s, so I hadn’t a clue what to make that was home-cooked and nurturing yet could be eaten warm or at room temperature…until I saw some freshly shelled Borlotti, or cranberry beans, at the local market. Perfetto, I thought, just perfect. With their distinctive ivory color and bright fuchsia marbling, borlotti are the crowns jewels of Italian legumes and have a short window of harvest time to take advantage of. 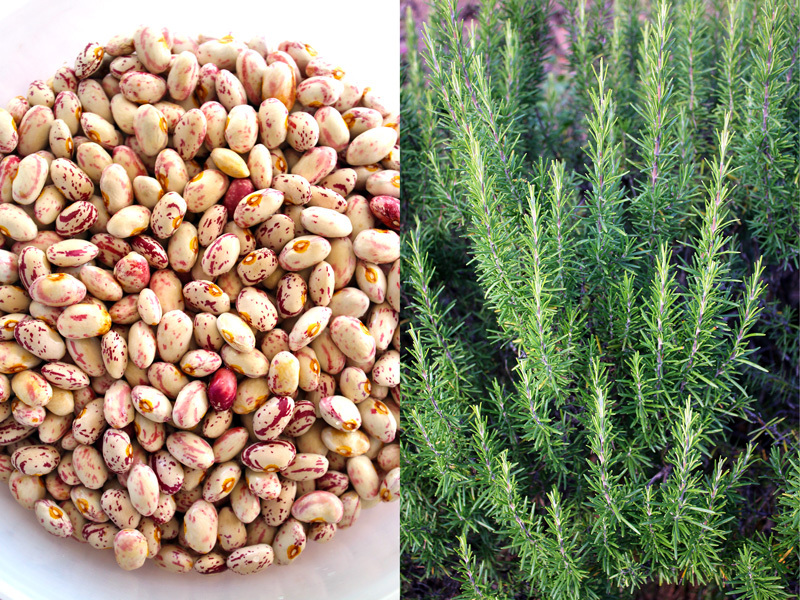 In California I rarely, if ever, find these beans fresh and usually have to use the dried variety, so I was excited to cook with them again and knew just what to make. I would prepare the iconic, local farro and bean soup called Gran Farro della Garfagnana in the afternoon that we could eat at room temperature that evening to temper the heat of the setting sun. In addition to the beans, I picked some fresh rosemary from the evergreen shrubs growing outside the kitchen door but needed another important item for this dish. 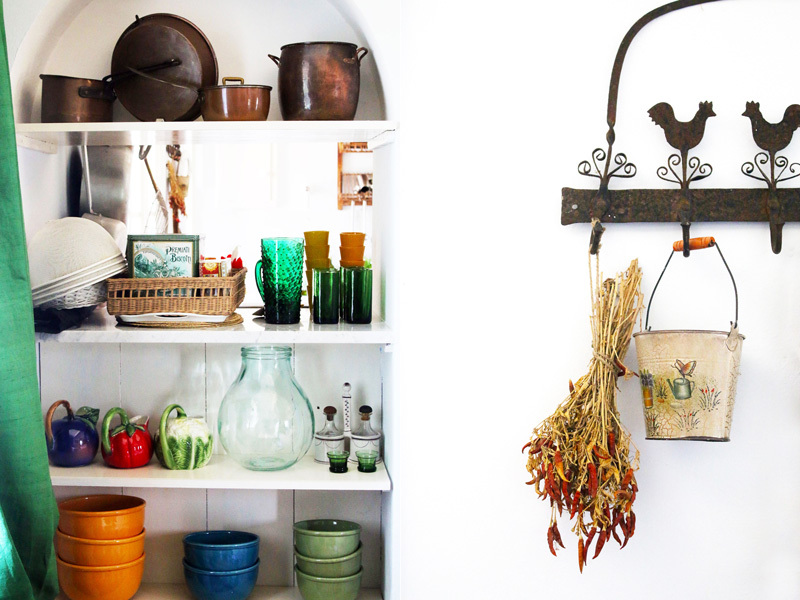 Rummaging through the drawers of an antique grocery store cabinet that served as the kitchen pantry, I found just what I was looking for — farro. 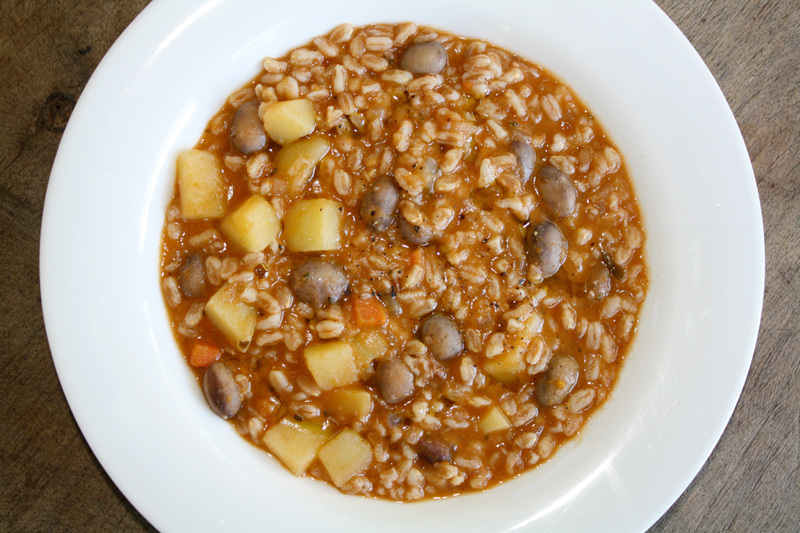 Known as emmer wheat in English, farro is an ancient grain grown in the nearby Garfagnana mountains high above the town of Lucca and is appropriately the star ingredient of this eponymous soup. 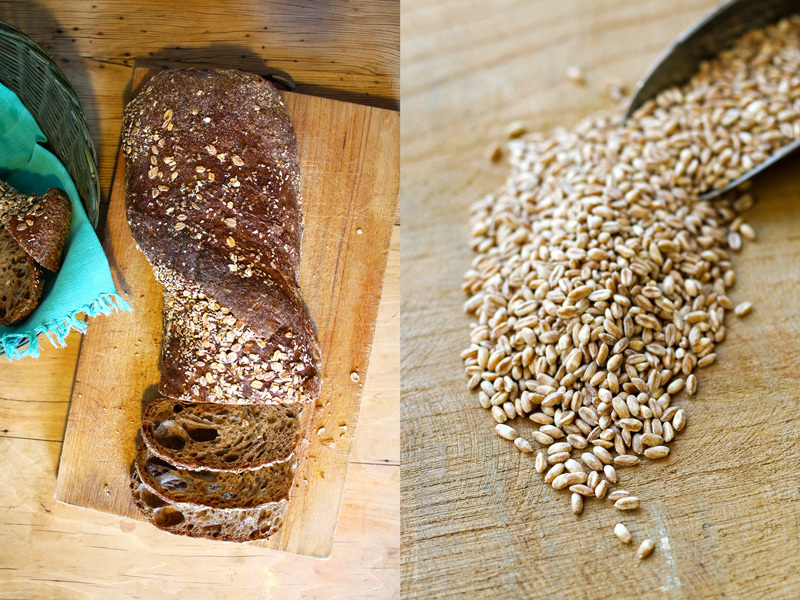 An exquisite grain used in lieu of rice in many Tuscan dishes, farro is an ancient strain of hard wheat with an easily recognizable oblong shape, sandy color and distinctive crease down the center. It has a pleasant nutty flavor and chewy texture and is rich in nutrients and fiber. In fact, it is said that Roman soldiers were fed a solid diet of farro to give them the strength needed to conquer the world. That’s quite a grain in my opinion! I grabbed a big pot off the wall and started the soup by making a classic soffritto — the savory base used in many Italian soups, stews and sauces — by sautéing the holy trinity of chopped onions/carrots/celery in plenty of extra virgin olive oil that was pressed the previous autumn from olives grown on the property. 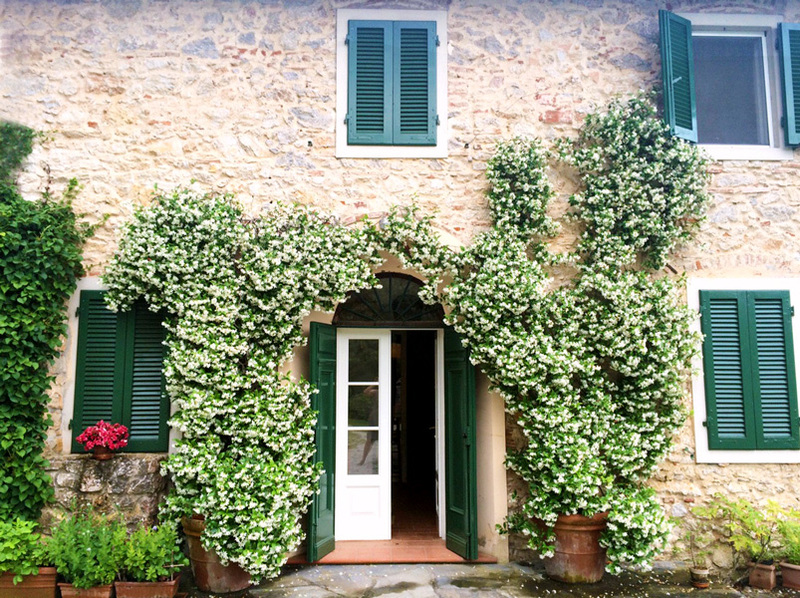 Oh, how I missed living in Tuscany! There was never a lack of gorgeous green olive oil at my disposal. Next, I crushed a few whole garlic cloves with the palm of my hand and tossed them into the pot. This is when tradition normally dictates the addition of chopped pancetta, but there was none in sight so I sprinkled in extra chopped rosemary and sage, which are Tuscan cuisine’s signature herbs. Lastly, I added a pinch of peperoncino chili pepper plucked from the dried bouquet hanging decoratively on the wall and deglazed everything with a big splash of local white wine. The soup had an amazing aroma even before I added chopped summer tomatoes that were so ripe you could smell the sunshine. Once the tomatoes cooked down, in went the fresh beans with a couple liters of water to cook at barely a simmer. After almost an hour, when the beans were tender and creamy, I scooped out about three-quarters worth and pureed them back into the pot using an old-fashioned food mill. I seasoned the soup with plenty of sea salt and freshly ground pepper then added the farro (using the perlato, or polished variety, that takes less time to cook) along with some diced potatoes, and simmered everything for another 20 minutes until the farro was al dente. 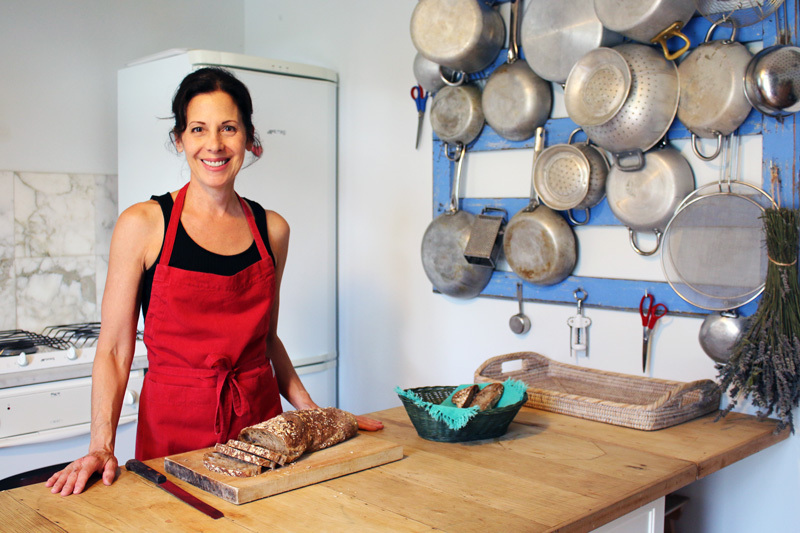 Even in blistering heat wave temperatures, I was feeling incredibly happy to be in my Tuscan kitchen again! It was then that I realized something else happened while I was cooking. As I stood stirring the soup, something stirred inside me. Maybe it was the intense heat or the heady fragrances filling my head, but suddenly the past didn’t matter anymore. All the sadness, fear, and hurt I was feeling had melted away — like the tomatoes in the soup. The only thing that really mattered to me now was that I was back in Italy again with my friends. Everything would be all right after all. “Che bella zuppa!” Maria Pia exclaimed, “what a beautiful soup” as we poured ladles of it into shallow bowls to cool before dinner. Once everyone arrived and was tucked in around the dinner table, the sun did a graceful dive into the horizon casting a loving glow across our plates and a balmy evening breeze drifted in through open doors creating the perfect atmosphere for a reunion dinner. “Cin cin” we simultaneously chimed, raising our wine glasses in unison. “Buon appetito and welcome back Deborah. We missed you,” Maria Pia said, smiling knowingly at me across the table. This was the long-awaited moment I dreamed of and it truly was…a warm welcome home. Copyright 2016 Deborah Dal Fovo. All rights reserved. This is my recipe using dried Borlotti beans so you can make this soup all year long. If you’re lucky enough to find fresh cranberry beans during the summer months, skip soaking and precooking beans and use the cooking procedure described in my post. See note below. Sort through the dried beans to eliminate any small stones or debris then place them in a large bowl and cover by 2 inches with cold water. Let the beans soak for 12 hours or overnight, during which time they will reconstitute and increase two to three times in volume. Drain the beans and place in a large pot, preferably made of glazed earthenware. Add 2½ quarts/2.5 liters cold water, 4 garlic cloves and sprig of sage. Place over medium heat and bring to a simmer. Cover the pot then reduce the heat to low and cook the beans at barely a simmer for about 50 minutes until tender, occasionally skimming off any foam that rises to the surface. Add 2 teaspoons salt and cook for another 10 minutes until beans are very tender. Scoop out ¼ of the whole beans with a slotted spoon and reserve. Discard the garlic and sage from the pot then puree the remaining beans with their cooking liquid using a food mill, emersion blender or food processor and set aside. In a large heavy bottomed soup pot, heat the extra virgin olive oil over medium heat. Add the chopped onions, leeks, carrots, celery and cook the vegetables, stirring occasionally, until glazed and golden, about 10 minutes. Add the garlic cloves and pancetta and cook, stirring, for 4 to 5 minutes then stir in the rosemary, sage and chili pepper flakes and cook for another minute. Pour in the white wine, if using, and boil for a minute or two until all alcohol evaporates. Add the tomato paste or puree and season generously with salt then cook for about 10 minutes, stirring occasionally, until the tomatoes begin to separate from the oil. Add the potatoes and stir to coat with cooking oils then add the pureed beans with their cooking liquid and bring to a lively simmer. Rinse the farro well under cold, running water and add to the simmering soup. Cook for 20 minutes with the lid slightly askew, stirring occasionally to prevent the farro from sticking to the bottom of the pot, and adding more water if needed. Add the reserved whole beans to the pot and cook the soup for an additional 5 to 10 minutes until the farro is very al dente, tender yet quite firm to the bite, and the soup is medium-thick in consistency. Remove from heat and taste to adjust seasoning if needed. Allow the soup to rest for at least 15 minutes before serving in shallow bowls with a generous drizzle of fruity extra virgin olive oil on top. Can be served hot, warm or at room temperature. NOTE: If using fresh borlotti (cranberry) beans, skip the soaking and precooking steps (1 & 2) needed for dried beans. Substitute dried beans with the amount of fresh beans indicated in ingredient list, keeping quantities of other ingredients the same, and follow the procedure described in the narrative of my post by adding fresh beans directly to the soup during cooking process. Source: Italian Chef Deborah Dal Fovo. All rights reserved. Join me for "TASTE TRENTINO! ", my exciting new 7-day/6-night culinary tour to the Trentino region of Italy - September 1-7, 2019. Get Inspired! Follow La Bella Vita.